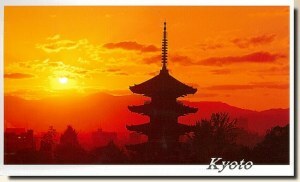 Kyoto is a city in the central part of the island of Honsh?, Japan. It has a population close to 1.5 million. Formerly the imperial capital of Japan, it is now the capital of Kyoto Prefecture, as well as a major part of the Osaka-Kobe-Kyoto metropolitan area. The city has been known since the later 19th Century CE for Kyoto University, and for being the headquarters of famous video game company Nintendo which began in Kyoto as a playing card company in CE 1889.